Lennar Corporation LEN announced that it will develop a new golf and country club community, Babcock National, situated northeast of Founders Square across Lake Babcock. The community will be located in the master-planned development in southwest Florida, Babcock Ranch. Through Babcock National, Lennar will offer 18 home designs, a mix of multi-family and single-family homes, with its signature Everything's Included program that offers a high level of standard features, which are already included in the price of the homes. Earlier to this project, Lennar introduced Trail's Edge — which provides distinctive villa, executive and manor homes — within Babcock Ranch. This master-planned community has a 440-acre photovoltaic solar power generation field and is attracting notable home builders like PulteGroup, Inc. PHM, among others. Lennar, being a leading homebuilder in the United States, offers a diversified line of homes for first-time, move-up and active adult homebuyers. The company’s ‘Everything's Included’ marketing program focuses on improving the value of its homes through standard upgrades and competitive pricing. The company is highly customer centric and regularly upgrades the homes to cater to the changing consumer requirements. Its NextGen homes are one of the instances of those initiatives. Notably, the company’s total revenues in the third quarter of 2018 increased 74% year over year, as the Homebuilding and Financial Services performed significantly well. Particularly in the Homebuilding segment, revenues grew 83% to $5.28 billion, driven by higher number of homes delivered and greater average selling prices. Also, new home orders rose 62%, with potential value of net orders surging 73% year over year to $5.1 billion. Backlog grew 88% to 19,220 homes from the year-ago quarter during the said period. Potential housing revenues from backlog increased 105% year over year to $8.4 billion. 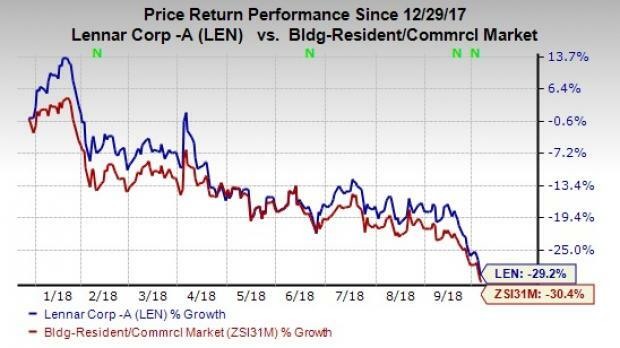 Although shares of Lennar have lost 29.2% due to construction sector ongoing headwinds, it has outperformed its industry so far this year. Also, earnings estimates for the current fiscal have moved 4% north over the past seven days. This signifies that analysts are optimistic about the company’s future earnings growth potential. Currently, Lennar carries a Zacks Rank #3 (Hold). Some better-ranked stocks in the Zacks Construction sector are Century Communities, Inc. CCS, and D.R. Horton, Inc. DHI both carrying a Zacks Rank #2 (Buy). You can see the complete list of today’s Zacks #1 Rank (Strong Buy) stocks here. Earnings for Century Communities and D.R. Horton are expected to grow 27.2% and 41.2% respectively, for the current year.